The mortgage industry of the United States has gone through several distinct phases of evolution that have allowed it to reach its current status as the largest and most complex home-financing market all over the world. 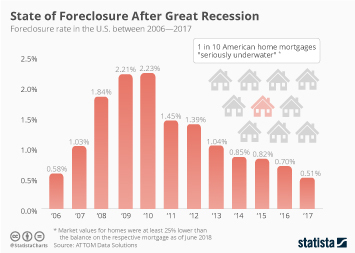 A mortgage industry overview in the United States is indicative of the vast scale of its mortgage sector, a status that has not always served as a badge of honor for the country. The U.S. subprime mortgage crisis set the stage and conditions that led to the financial turmoil and subsequent recession of 2008. Forecasts, statistics, and estimates relating to the direction in which the mortgage market has been moving since the crisis of 2008 have been mixed and continue to be despite the emergence of a recovery in the sector; banks once again began to lend, interest rates fell, consumer confidence increased and people once again felt secure enough to spend and invest. Industry trends and forecasts from 2017, especially with regards to the construction sector, are all pointing towards a recovery; as the new house starts and total home sales continue to show. Mortgage debt is the largest form of debt among American consumers. The total value of mortgage debt outstanding in the United States amounted to 14.9 trillion U.S. dollars in 2017. This figure seems set to rise in the future. Number of housing starts in the U.S.